The Scottsville, Kentucky Garden Club organized a basket workshop for its members and they asked me to create a useful basket with wooden base, braided sea grass and one of our signature oak swing handles. They've named it 'The Garden Basket'; it's pretty, it's practical and it's one you'll use often whether outside in the garden or indoors. 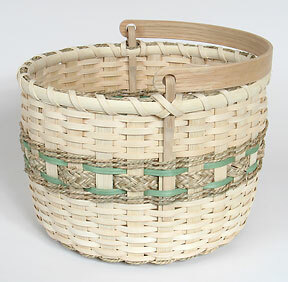 Starting with an 8" round slotted base and using 5/8" flat for the spokes, this easy-to-make Garden Basket has accent rows of #0 sea grass, braided sea grass and moss green dyed reed. What a great addition to your collection. Calculate Supplies for 1 to 20 Garden Baskets with the Basket Supply Calculator. The Supply List gives you the least expensive way to purchase the supplies for your quantity of baskets. View on-line or print to your printer.